In 1740, young Cormac O'Connor arrives in New York City from Ireland to avenge the deaths of his parents. On the voyage to New York and after their arrival, Cormac shows kindness to an African slave, Kongo, who later repays his kindness by granting Cormac eternal life. The conditions are that Cormac can never leave the island of Manhattan and must fully carry out his mission of revenge. It isn't until the early 2000s that this opportunity comes about, and in the meantime, we see Manhattan grow from a small village mostly populated by the wolves in its forests to the thriving mega-city we all know it as today. From the American Revolution, the slave revolts, the Civil War, the Prohibition, to 9/11, we see all of these events through the eyes of one person. Interestingly enough, in an interview at the end, the author says he actually completed the book on September 10, 2001. He went back and revised it, later saying, "I couldn't have a New York novel that had the 1835 fire and the cholera and smallpox epidemics, and not include September 11." I felt that the 9/11 section was the most haunting (though terribly foreshadowed), but that's probably only because it's the only section of the book I'd ever personally experienced. Overall, this was a pretty interesting read. I should mention that there are about 150 pages of back story before he even arrives in New York, but most of it was relevant as to why Cormac is doing most of the things he does. I still think that as concise and long as this book was, we still missed out on some periods of time that would have been fun to read about; the entire 20th century was virtually ignored. How fun would it have been to read chapters about the flappers? Immediately upon finishing this book, I spent at least 15 minutes figuring out what I would have done if I'd been in Cormac's place. I think I'd like the fact of observing history in the making and watching all the changes going on around me. It'd be like being a vampire..without actually being a vampire. On the flip side, it would be torture to have all the people I ever cared about eventually die and leave me alone. As in Cormac's case, never being able to travel beyond one place would be pure torture! What would you do? Just today I was looking at a copy of his new book, Tabloid City. I put it back on the shelf, unsure, but Forever sounds fascinating. I'll have to check it out. I read this several years ago, but like Allie, I remember really enjoying it. In fact, I've culled through my books quite a bit in the last few years (because I had not bookshelves), but I hung on to this book. I remember parts were draggy, but I thought the history and his inability to do anything but watch it were fascinating. Great reminder review! This fell off our reading radar a few years ago. You've gotten us to put it back on the too read pile! Thanks! I've never heard of this one but I'm glad I have now; I'll definitely be checking it out! This looks right up my street. Another one for the TBR pile! I loved this book. I thought the writing was fantastic. When he was talking about the Lower East Side and it's stink, I could actually smell it. Super gross but it added to the story completely. 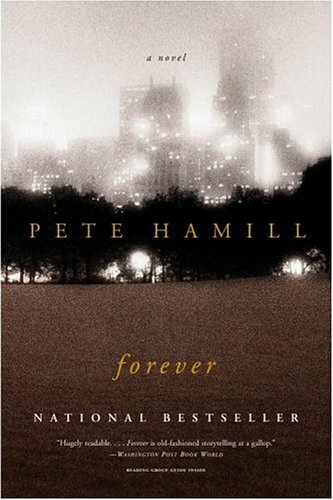 I'd recommend this one to anyone that has a love of all things NYC. While the 20s century was skipped, I think the bigger story was in old New York which was shown through expertly. Pete Hamill knows his New York. Not to be a punster, but I really have wanted to read this book forever! The premise sounds so interesting. I think it's going to be one of those books that will make me annoyed that I took so long to read it. Moving it up on the TBR list right now!